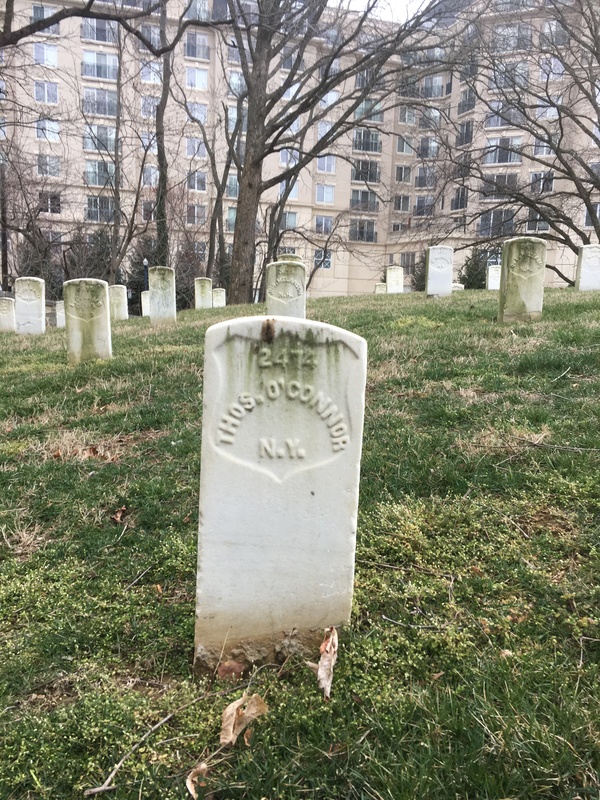 Whenever I get an opportunity to visit the United States I always try to make it to one or more of the National Cemeteries dating to the American Civil War. I walk the long straight rows of white grave markers, looking out for Irish names, and pondering the events that led to the end of these men’s emigrant journey. When I return to Ireland I research some of those I encountered, seeking to uncover something of the real human stories that lie behind the tombstone inscriptions (for a previous post see here). 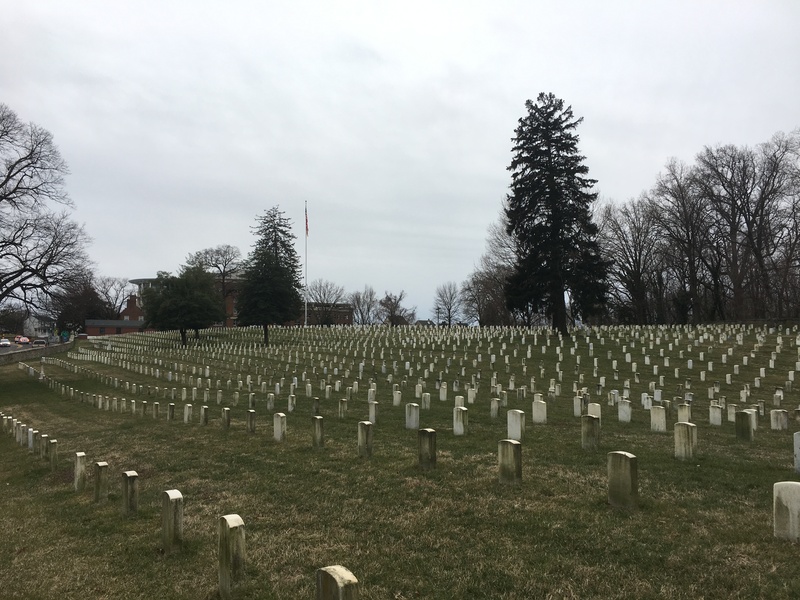 Last March I had a chance to visit Annapolis National Cemetery in Maryland with my good friends Jackie and Ken Budell. The cemetery at Annapolis contains the remains of nearly 3,000 individuals, the majority of whom died between 1861 and 1865. 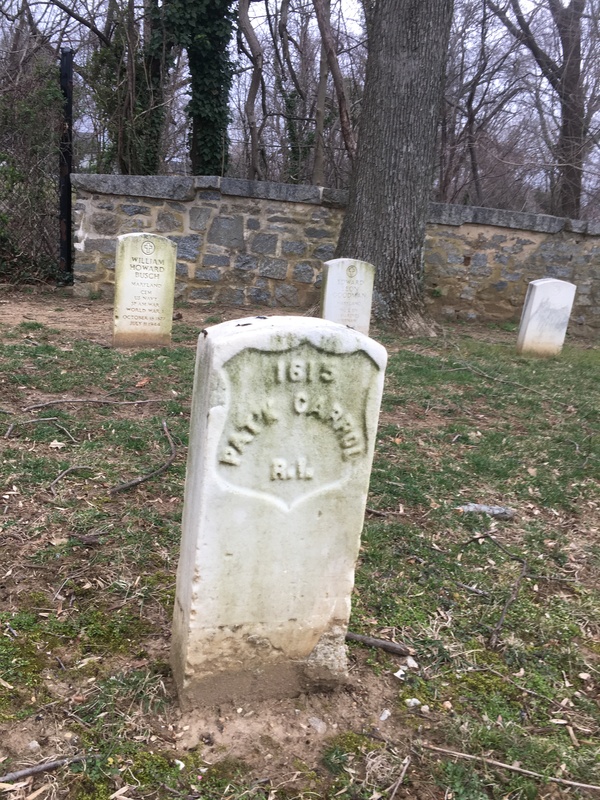 Some were soldiers who died of wounds or disease in one of Annapolis’s hospitals, but many more were paroled former prisoners, who succumbed while waiting to be officially exchanged in the overcrowded conditions of “Camp Parole.” Below readers will find the stories of 12 of these Irishmen. They came from all over the island- from places like Cork, Meath and Roscommon- many leaving their homeland during the Famine. 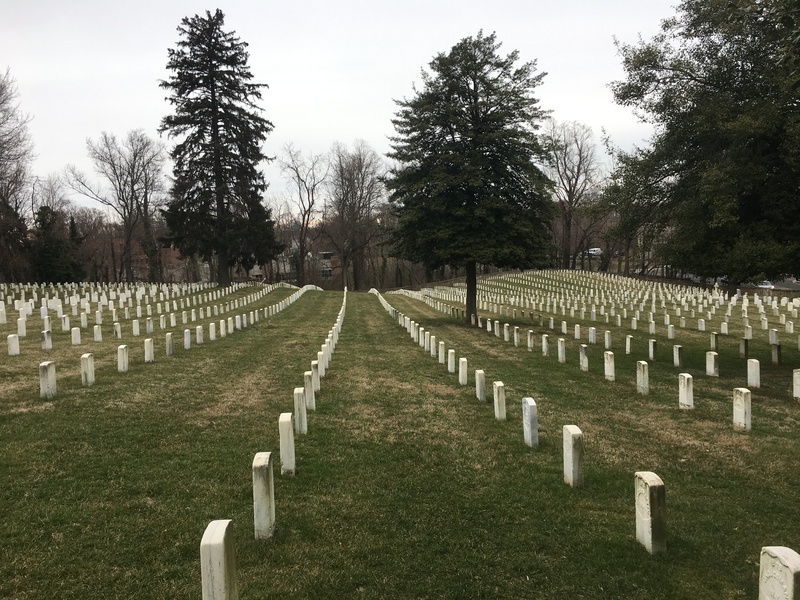 For each of them their journey ended at Annapolis National Cemetery. 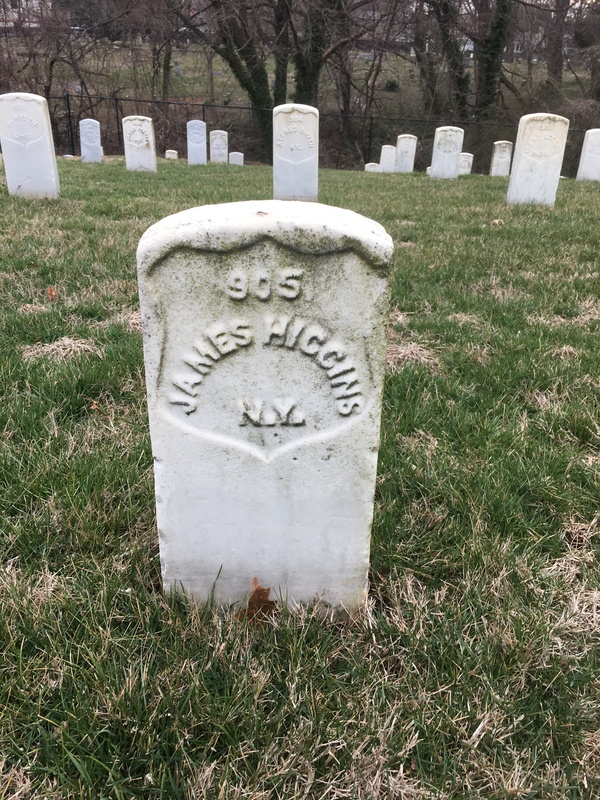 James Higgins, 173rd New York Infantry, Ireland. James had enlisted in Brooklyn at the age of 40 on 3rd September 1862. Serving in Company A, he was captured by the Confederates and confined as a POW. He was presumably exchanged, but died of chronic diarrhoea in the General Hospital at Annapolis on 12th January 1864. He had married Mary McCabe in St. Patrick’s Church, Newburgh, New York on 11th February 1847 and the couple went on to have four children, Katie, John, Edward and Sarah Ann. After James’s death, Mary remarried, wedding James Baldwin in Brooklyn on 20th September 1865. Though she still appears to have had involvement in her children’s lives, their direct care passed to a guardian, Timothy Casey. 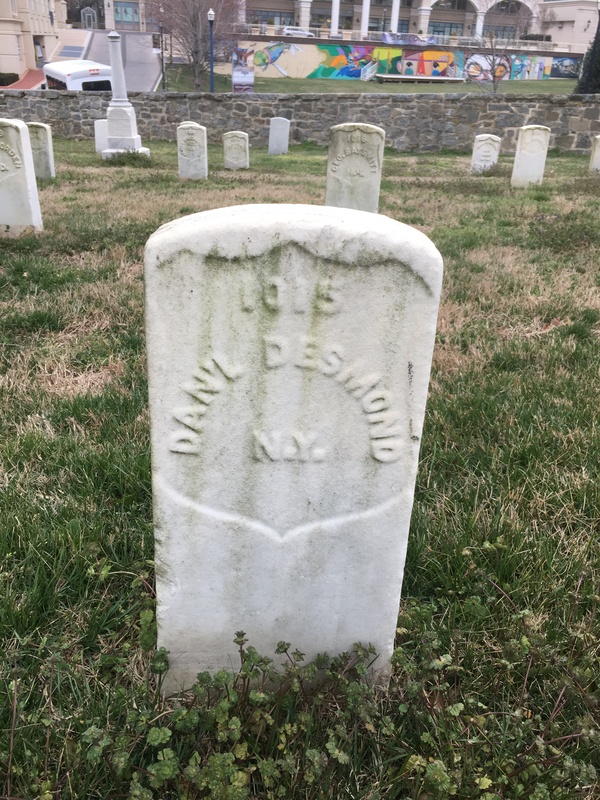 Daniel Desmond, 51st New York Infantry, Grenagh, Co. Cork, Ireland. Daniel, a 42 year-old tailor, enlisted on 14th March 1864. 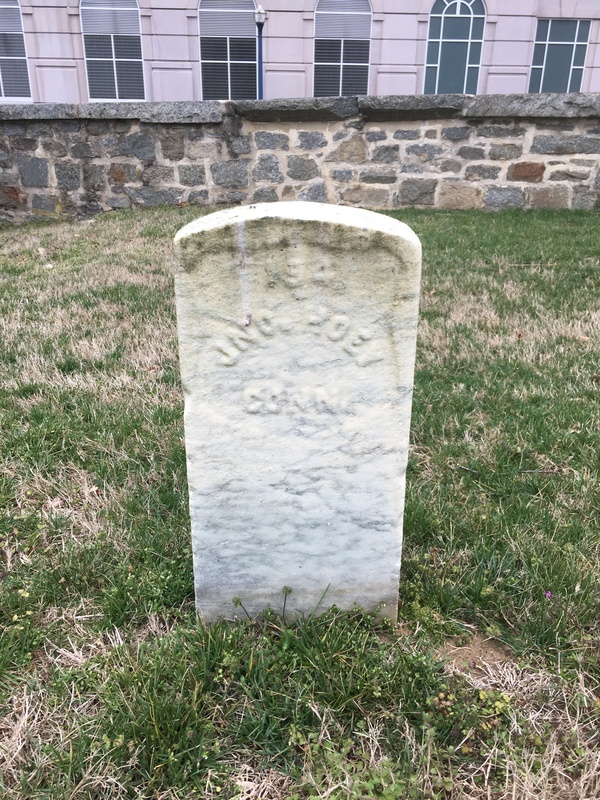 A private in Company E of the 51st New York, he was among a large number of the regiment captured at Poplar Grove Church, Virginia on 30th September 1864. Paroled in North Carolina on 26th February 1865, he died at Camp Parole, Maryland on 26th March 1865 of phitisis. Daniel had married Eliza Walton at Grenagh in Co. Cork on 16th August 1848, and emigrated to the United States soon afterwards. Of their ten children, only three survived. They spent the majority of their time after Daniel’s death in the care of their Uncle William in Roanoake, Indiana, who claimed Eliza had abandoned them due to intemperance. Eliza, who was described as a “confirmed inebriate”, was sent to Blackwell’s Island on at least two occasions due to her addiction. She had the pension returned to her when her youngest child reached 16. You can read a more detailed account of the Desmond family story here. James was one of six children of Conor and Mary Bracken, who were married in Meath on 15th August 1834. Conor died in Ireland in 1849. 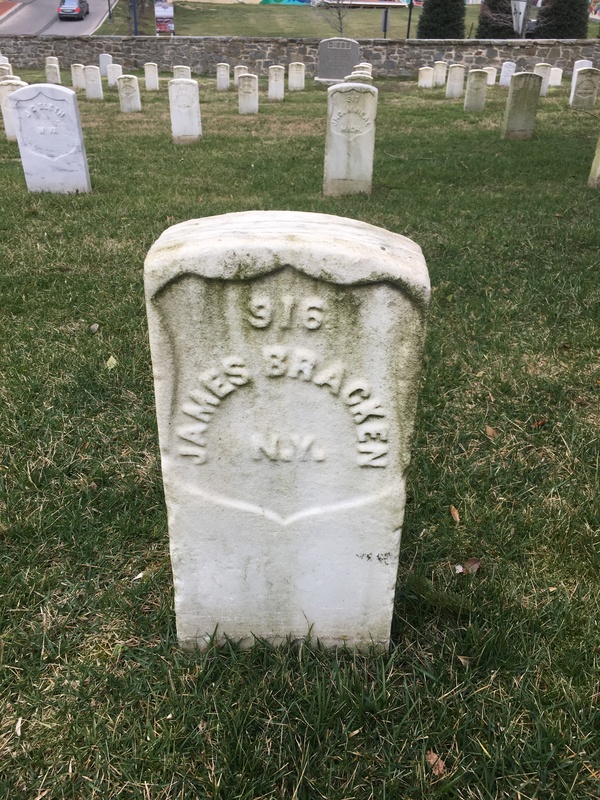 James, a paper stainer by trade, enlisted in the army from Brooklyn on 18th August 1862. He held the rank of Corporal when he was shot at the Second Battle of Deep Bottom on 16th August 1864 and taken prisoner. He was paroled and died from his injuries in the No. 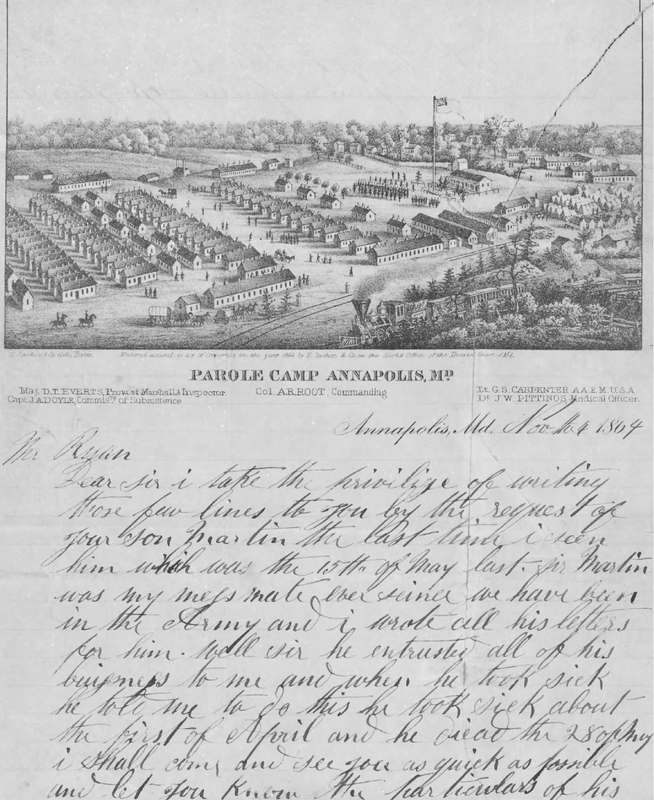 1 Division Hospital, Annapolis on 24th August 1864. His mother Mary received a pension based on his service. 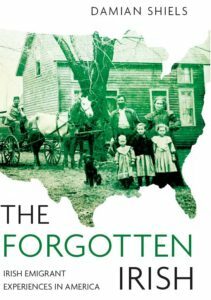 Many thousands of Americans who died during the Civil War were the children of Irish emigrants. Edward MvEvoy, who was enrolled on 28th December 1863, was one of them. His Irish emigrant father John, a laborer, had married Vermont native Betsy Rindge in 1840. Betsy died in 1859. 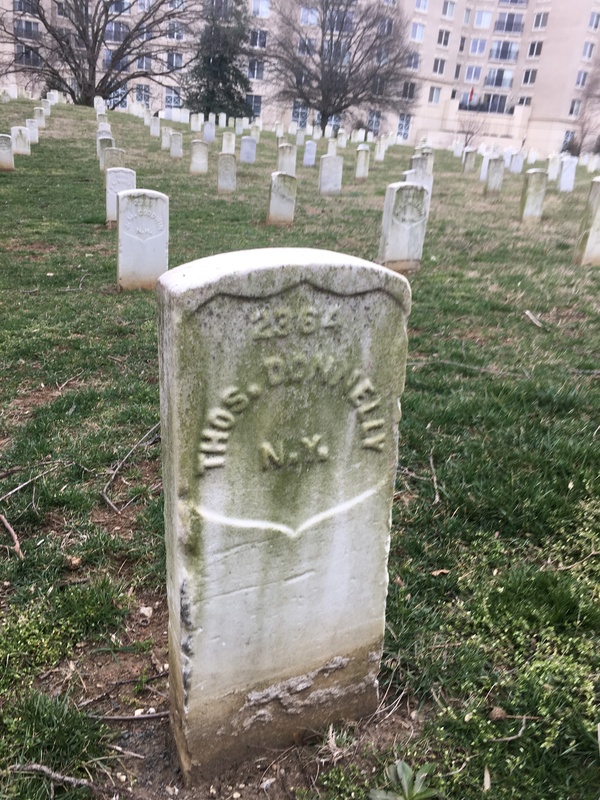 Reported missing in action on 13th June 1864 (presumably captured), Edward died of chronic diarrhoea at the 1st Division Hospital in Annapolis on 17th December 1864. John was in his 70s when he received a pension based on his son’s service. Thomas was described as 5 feet 10 inches tall with blue eyes, a dark complexion and black hair. The baker was 22-years-old when he enlisted in the 170th New York, Corcoran’s Irish Legion when he enlisted on 10th September 1862. The Galwegian was a married man, having wed Mary Ryan in St. Andrew’s Catholic Church, New York on 6th October 1861. Thomas was reported missing in action at Ream’s Station, Virginia on 25th August 1864, one of the many Second Corps men to be captured that day. Thomas was eventually released, but his body was broken. 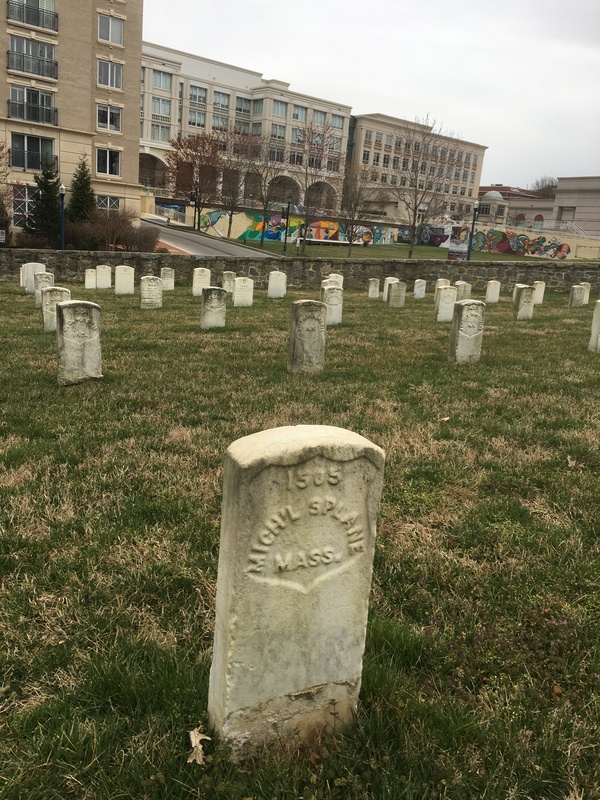 He died of Typhoid Fever in the 1st Division Hospital at Annapolis on 24th March 1865. John and Ellen Hoey were married in Trim, Co. Meath in November 1845. They and a number of their neighbours emigrated to the United States during the Famine. By the time of the war, they had four living children under 16, Richard (b. 1851), Michael (b. 1853), James (b. 1858) and Mary Ellen (b. 1861). Having spent time in Massachusetts, by then they were living in Thompson, Connecticut. John mustered in as a private on 11th February 1862 and was captured at the Battle of Cedar Creek on 19th October 1864. He was paroled, but died before he could be discharged, succumbing to pneumonia on 26th February 1865. Ellen passed away in Thompson on 19th April 1867, leaving the children orphans. James Munyan applied for the children’s minor pensions on behalf of the children. Thomas O’Connor and Jane Crooks were married in Ireland on 30th May 1843. Thomas was 34-years-old when he enlisted on 4th July 1861. He was taken prisoner at Ashland Station, Virginia on 1st June 1864. Paroled, he died from “the effects of prison life” in Annapolis on 31st December 1864. I am truly sorry and distressed to write and inform you of the death of your husband Michael Splean in this hospital. 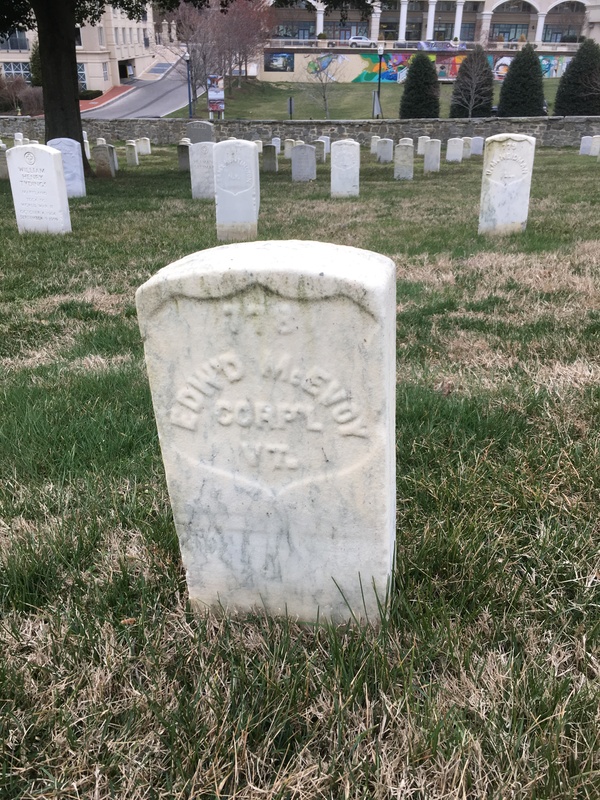 He was taken sick in camp, with pneumonia, and was brought to the hospital on the 28th and died this afternoon of the 30th at about 4 o’clock. He was very severely sick and it was impossible to save him. He told me that he had a wife and two children and said he wished I would write to you about him. This was about an hour before he died. I asked him if he loved his saviour, and felt that he should be happy with him if he died; he said he should but he was too sick to converse much. This is very sad news to write you but I hope you know now to go to your dear saviour with all your troubles, he alone can help you to bear him. Your husband will be tenderly buried in the soldiers lot, where more than two thousand of our brave men are sleeping. Be thankful that you have so lately seen your husband after his imprisonment, & can bear something of his death; while so many can never know how and where their friends have died. Michael’s widow Margaret remarried in 1868, wedding New Brunswick born David White. The couple’s children Cornelius and Mary made their life with their mother and stepfather- on the 1870 census they were recorded as attending school in Boston’s First Ward, while David earned a living as a shoemaker and Margaret as a washerwoman. Hugh Rooney was born in Co. Roscommon. His father James died there during the years of the Famine, in 1849. James’s wife Elizabeth emigrated with her family- including Hugh- to the United States, ultimately settling in Fall River, Massachusetts. The 1860 Census shows the 60-year-old woman boarding with the family of Michael Dolan [Dowling], a day laborer, with whom she had made her home since 1857. Hugh had paid for his mother’s board there, to the amount of some $400 prior to his enlistment. 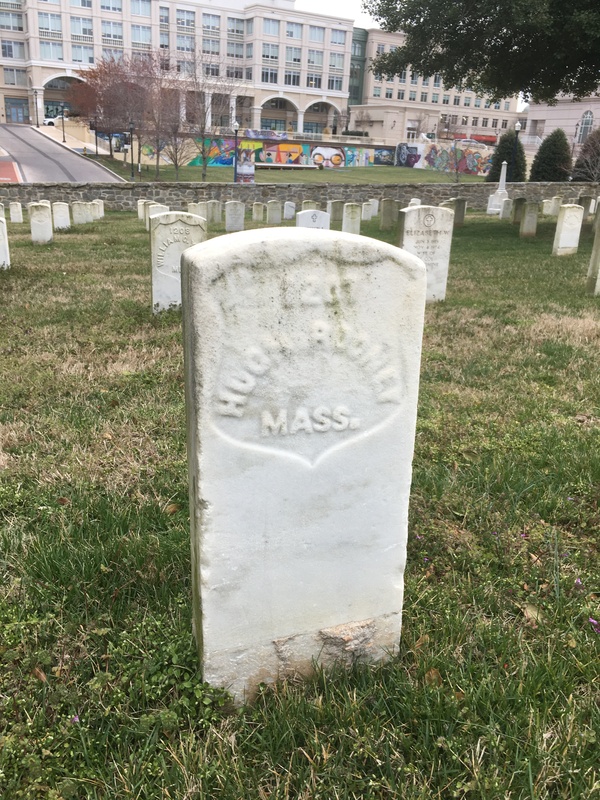 On 22nd February 1864 Hugh was enrolled in the 58th Massachusetts at Fall River. On 17th June 1864 he was wounded at the Second Battle of Petersburg, and was taken to hospital in Annapolis. He survived for almost a month, before dying on 12th July 1864 from his injuries. His mother outlived him by over 15 years. Patrick was born in Ireland in 1844. The 1860 census shows him living with his mother Ann and younger sister Catherine in Smithfield, Providence, where Patrick worked as a carder in a woolen mills. Patrick’s father Michael had died around 1851. The young man was enrolled in Providence on 21st August 1862. Clearly a good soldier, he was promoted to Corporal in Company C of the regiment when it was reorganised. Patrick came tragically close to surviving his Civil War service. It was at the Battle of Sailor’s Creek on 6th April 1865 that he received his mortal wound, one of the final major engagements of the war. Struck in the groin, he was taken to the Naval School Hospital in Annapolis where he died on 16th April. Thomas and Mary MacKay were married in St. Peter’s Church, New York on 12th June 1851. By the time of the war they had one child under sixteen, James, born around 1852. Thomas was 42-years-old and worked as a laborer when he enlisted in Brooklyn on 3rd September 1862. He was described as 5 feet 8 inches tall, with blue eyes, dark hair and a fair complexion. He was wounded by a shell during the Second Battle of Petersburg on 16th June 1864, dying in Divisional General Hospital No. 1, Annapolis on 28th June. At the time Mary lived at 302 Hicks Street in Brooklyn. 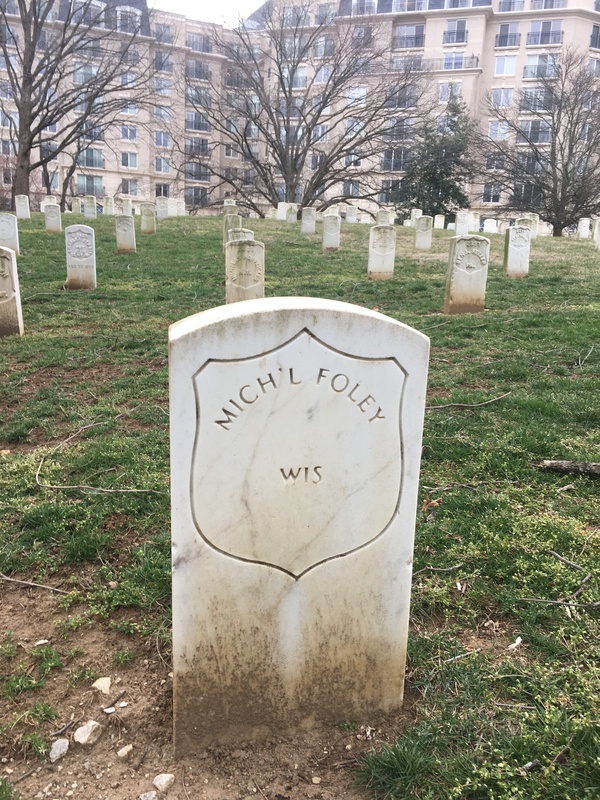 Michael and Margaret Foley were married in Ireland on 16th April 1843. They went on to have at least six children, whose places of birth help to chart their emigrant journey- a journey that most likely started with the Great Famine; Mary Ann was born in Canada around 1847, with Michael (b. 1848) arriving in New York, and John (b. 1850), Bridget (b. 1852), Margaret (b. 1855) and Matilda (b. 1857) all coming into the world in Wisconsin. By 1860 the family were in Deerfield in Dane County, Wisconsin, where Michael, then 45-years-old, worked as a day-labourer. Michael was enrolled in the 5th Wisconsin at Madison on 28th August 1862. He died of chronic diarrhoea at the General Hospital in Annapolis on 29th September 1863. Margaret went on to remarry in the late 1870s. The source material for this research was drawn from a combination of the Widow’s Certificate series in the National Archives, the 1860 and 1870 United States Federal Census, regimental rosters and histories, regimental muster rolls and service records. If you would like details of references with respect to any of the stories featured above please contact me. Redemptorist Fathers at nearby St. Mary’s in Annapolis were often found ministering at Camp Parole. 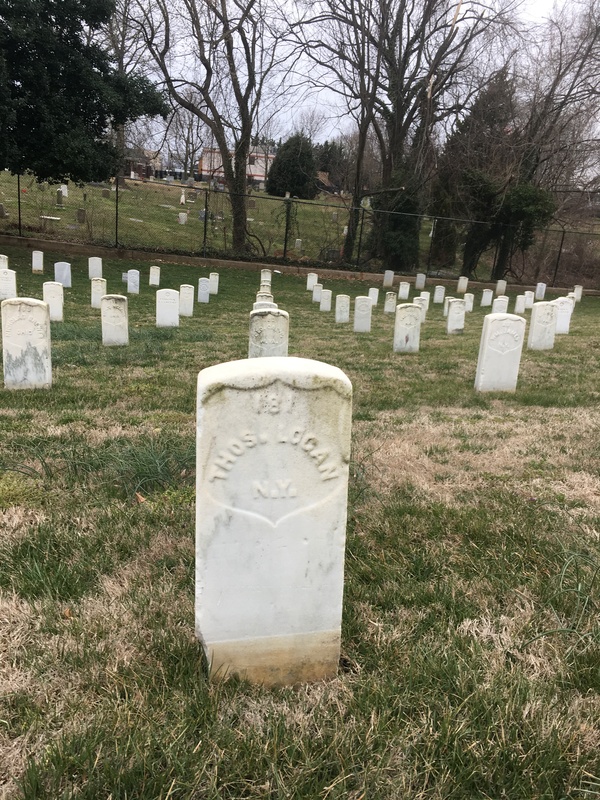 A new book is on the horizon by parish historian Robert Worden about Annapolitans and the Civil War, so I expect there will be a broader context made available on this cemetery and those in it. A fine post!